This is a delicious side for any meal. The skin of rutabaga is thick and tough, so you’ll want to use a sharp, hefty chef’s knife to remove it entirely and later to cut the flesh. 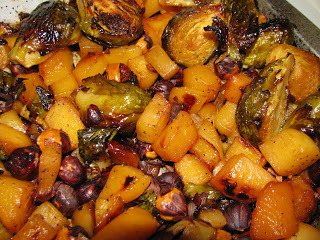 The maple glaze tends to caramelize quickly, so be sure to keep an eye on the vegetables during the final stage of roasting. Preheat oven to 400 degrees. Whisk together maple syrup, oil, lemon juice, and 1/4 teaspoon salt in a large bowl. Add rutabaga and toss. Transfer rutabaga and all but 2 tablespoons of the glaze to a rimmed baking sheet (leave remaining glaze in bowl). Spread rutabaga in a single layer, sprinkle with 1/4 teaspoon salt, and roast for 35 minutes, tossing halfway through and making sure rutabaga is spread toward the edges of pan. Raise oven temperature to 450 degrees. Toss brussels sprouts with remaining glaze in bowl and 1/4 teaspoon salt. 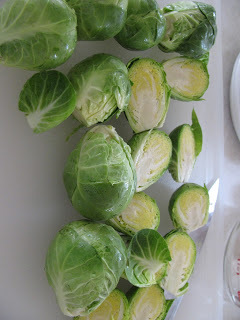 Remove sheet from oven, and add sprouts. Toss, and spread in a single layer. 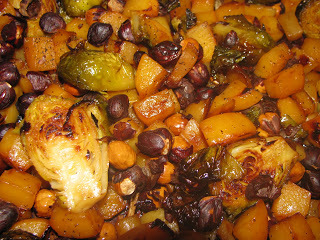 Roast vegetables, tossing every 5 minutes, until glaze is very thick and vegetables are deep golden brown, about 20 minutes. Season with pepper and sprinkle with hazelnuts. It makes a great side dish. Bon Appetit!